Hi - and welcome to the norwegian stop of the blog hop!! to the start of the hop at Stuck On U Sketches! Lighning McQueen pillow thing around my neck though...). be translated to " Traveling with yarn and needles". 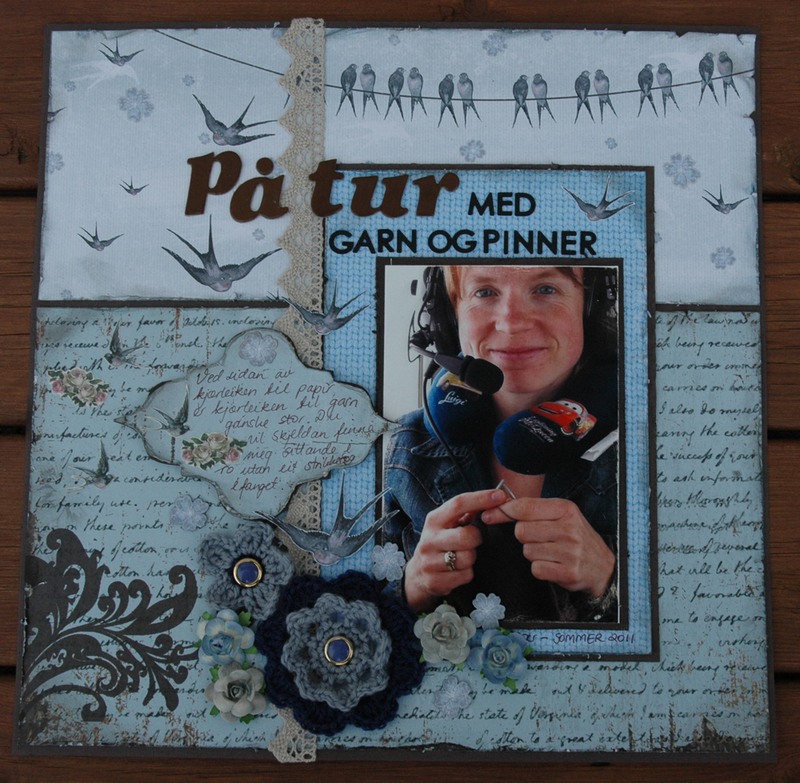 I have used papers from Papirdesign and Fabscraps. In the next picture you can see my journaling spot better. This is a die cut from Nellie Snellen. I just love this shape!! You can also see the crocheted flowers I made for this layout -perfect for a layout about my relationship with yarn, and you can see them even better here. I have embellished them with some vintage buttons that I have from my late grandfather's old store. The gorgeous paper roses are btw also from Papirdesign. 1. If you were a crayon, what color would you be? Why? 2. What would people be surprised to learn about you?I have a masters degree in Musicology with soviet music as my speciality, and I have studied russian language (never learned it properly but will get back to that again when the kids are older). 3. What 5 things are always on your crafting table?Distress inks, my distressing tool, my cricut, pearls/rhinestones and different kinds of glue. 5. What is your all-time favorite crafting tool?My distressing tool from Prima - made by Ingvild Bolme. 6. Tell us about your family .. first in one word. Then in a sentence or two. My one word is whimsical. My family is full of love and always fun to spend time with. Disney land and Harry Potter world!! 9. 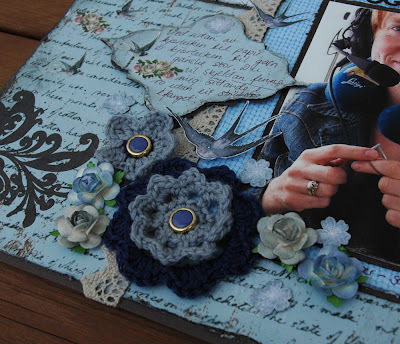 Tell us a bit about your crafty style. I like soft colors and distressed edges. My style is a bit too symmetrical I think, but I am working on that LOL. I live in Northern Norway. My winner will be randomly drawn after this weekend! I hope you have seen that there is also a yummy blog candy at Stuck On U Sketches. Thanks again for stopping by. Your next stop will be Theresa Kelly!! Woowwww! What a gorgeous layout! Fabulous colors and such beautiful papers and details! Oh, I hope you have a wonderful time away! The layout and your photo really made me smile and I'm so glad that you used your beautiful flowers on it...someone will be a lucky lady to win something to treasured! You are an incredible friend and a wonderful, talented crafter! Such a beautiful layout! Those knitted flowers are perfect, and I love that you used buttons from your grandfather's store! Great answers and a wonderful project!!!! Nice to meet you. One of my have pages of yours .. and love that you are in it! Those flowers are amazing and someone will be very lucky to get them!! Gorgeous layout and I think it looks wonderful in blue! So nice getting to know more about you! Your layout is pretty. The crochet flowers make me miss my Granny. The are so lovely. I have her button box but use them sparingly. Thanks for sharing. Oh Stine what a Pretty layout! Oh I wish I could Knit (but I don't need another obsession, lol) Love the flowers and the Vintage buttons (along with where they came from) I do crochet though and recently started making my own flowers too. It was so fun getting to know you and some lucky lady will treasure those flowers! Beautiful layout, Stine!!! 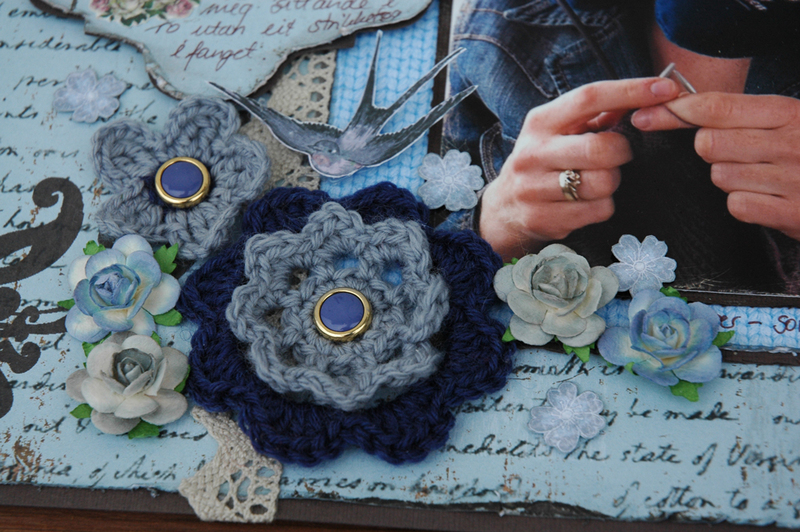 The blue is perfect, and your flowers are wonderful... How lucky you are to have the vintage buttons!! Enjoyed reading about you!!! Have a wonderful weekend!! Hugs!! Du er altså SÅ flink! Gorgeous layout and your flowers are so pretty. I need to learn how to crochet!Looking forward to May and getting to know this amazing team! Wow!! Awesome LO!! Love the blues!! Your crocheted flowers are amazing!! SUch a delightful page and photo of you, Stine! 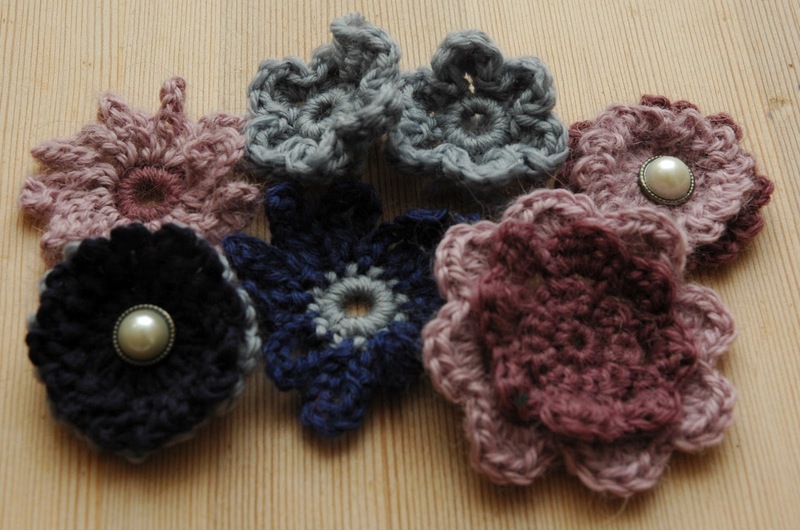 I adore your crocheted flowers too! Beautiful! Love the shades of blue. I'm a new follower. Very cool. I love the layout. What a perfect title for it too. Thanks for translating it..
Beautiful! Love how you took your love of knitting and added your beautiful flowers to the layout! Beautiful layout. Love your work. Thanks for sharing about you! Such a beautiful layout! I LOVE the color scheme you've chosen and the details you've added are just perfect. I really enjoyed reading your answers.